Smoked fish is perfect for Nigerian Okra Soup, Concoction Rice and Abacha (African Salad). Sometimes, you will find it in Bitterleaf Soup and Ora (Oha) Soup and many more traditional Nigerian soups. 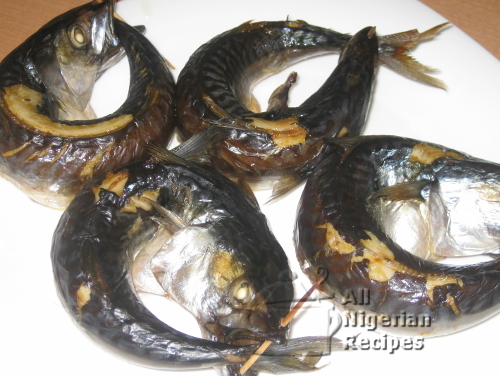 The only fish you should use when making Smoked Fish for Nigerian recipes is Mackerel (Azu Eke in Igbo), the one fondly called Titus in Nigeria. The good thing is that this fish is available everywhere in the world. In Nigeria, smoked fish mongers prepare this by roasting the fish in smoky dry grass with little or no flame. The heat from the smoky grass dries up the fish and puts it in a state that brings out the taste of some traditional Nigerian recipes. On this page, I'll give details of how you can replicate the process and enjoy smoked fish wherever you are in the world. Smoked fish stores well in the freezer so prepare as much as you want and store in your freezer. Note: You can use either a microwave oven with a grill setting or a conventional kitchen oven (gas or electric) for this. I prefer a conventional kitchen oven because it gives me better results. I also have more control during the grilling. Clean the fish by removing the intestines and the gills. You may leave in the intestines if you like, as done by smoked fish mongers in Nigeria but the intestines give the fish a bitter taste when done. This is why I remove the intestines before smoking the fish. Rinse the fish thoroughly to clean all the blood. Rub some salt all over the fish. Do not go overboard with the salt, fish can easily get too salty. Bend the fish and put the tail fin across the mouth. This will be like the fish is biting off it's tail fin. Use the toothpick to pin across the upper and lower jaw of the fish. Repeat the process for the rest of the fish. Place some foil on the oven rack. 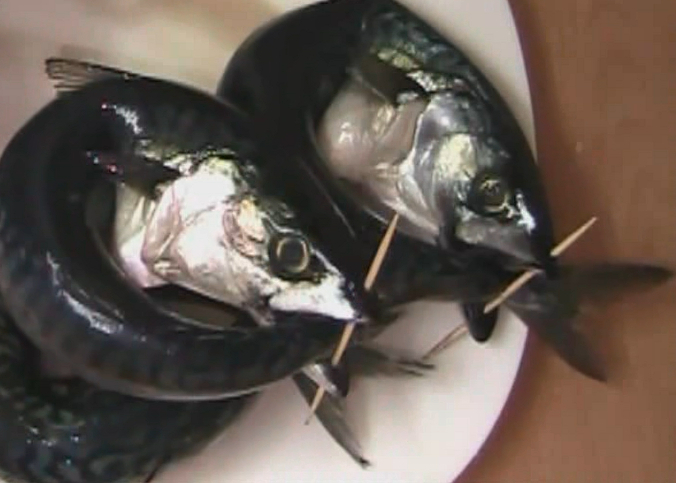 Place the bent and pinned fish on the foil lined oven rack and cover with another sheet of aluminium foil. Set your oven to 250°C / 480F and top and down heating (bake). The bake setting cooks the fish before the drying starts. Bake for 15 minutes. I used small sized Mackerel so if yours are bigger, bake for much longer. Remove all the foil sheets and change your oven setting to Grill/Broil and grill for 10 more minutes or till the fish browns. The fish is ready to be used in all Nigerian recipes that call for smoked fish.